It was expected that Google is about to deliver yet another fireball towards webmasters because there were lots of rumors about Panda Algorithm update. 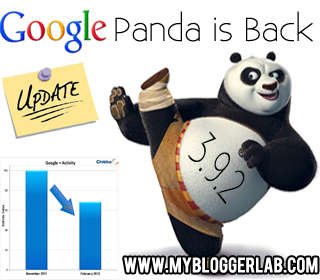 Finally, Google has announced that they have refreshed their Search algorithm and this time it is Panda 3.9.2 update. However, Bloggers and webmasters are still waiting for a Jolting Penguin Update because Matt Cutts in an SES San Francisco 2012 conference said that, “it will be a terrifying update”. This current update has not affected lots of queries, just like other updates it is also a negligible one because it hardly affected 0.7% of queries. Today we will discuss about the Panda 3.9.2 Update and how bloggers can survive it without losing a significant amount of traffic. As always Google utilized Twitter to inform the whole webmaster community that, they have rolled out yet another Algorithm change to their search engine that hardly affected 0.7 percent of queries. Just like Previous 3.9.2 refreshment, this one is also a negligible update because Bloggers plus webmasters are well aware of the fact that Quality content is must to keep them safe from getting penalized. Following is the copy of the Screenshot of Google’s confirmation about the 3.9.2 refreshment. Identify whether your site is affected by any of the algorithm refreshments is something that annoys a web owner, because there are hardly any way that gives a perfect answer. However, following are the few ways through which we can identify that we are hit by algorithm refreshment or not. Comparing Old And Current Traffic Stats: Firstly, we have to compare our old traffic statistics with our current traffic stats, and then have to measure how many visitors are dropped or gained. If the numbers of visitors are not the same that it was before refreshment, then it is quite sure that we are hit by an algorithm change. Checking the Search Engine Ranking: Secondly, we have to check our SERP (Search Engine Ranking Position) of our few highly ranked keywords which always provided tons of organic traffic, and if they are not ranking among the TOP 10 results, then your site may have been penalized. How To Ask Google To Reinstate your Traffic After Panda 3.9.2? If you are thinking, that Google has penalized your website by mistake, then you have the liberty to request them to reinstate your SERP Ranking. Google’s Reconsideration request is a handy tool that allows a webmaster to send a request to Google web spam team, only if he thinks that his website is penalized without any reasons. To Send Reconsideration request follow the following instruction. Remember: Before your send a request it’s essential to Read How to write a perfect reconsideration request. Sign in to your Google Webmaster Tool and Verify your Blog. Now Visit Reconsideration Request Page. Fill out the detailed information, what happen with your blog and send your request. Alhamdulillah, MBL blog is picking up that pace, and that’s splendid news for all of us. After the previous Panda update, we witnessed a slight down fall in our traffic but on this 3.9.2 update things have become better, Thanks to everyone for supporting us through this tough time. What do you think about this 3.9.2 Panda update? Till then peace, blessings and happy refreshing. Traffic Dropped: Panda appears to be angry with you. Traffic Gained: Panda loves your company so enjoy playing. Traffic Retained: Panda don’t know much about you. Thanks for the update bro. I won't be able to find any traffic change on my blog as i just moved to wordpress,it will be evident in a month. Suppose, My website traffics are falling down by previous update but my keywords position are stable then what step should I take? Secondly, I want to send a request to Google Web Spam Team for review my site. Can I send request to Google for that. Yes Bro You can send a request to Google. My traffic has increased thrice. Thanks my dear friend Syed Faizan. Brother Panda is the Google's Search Algorithm Which is Frequently Updated by Them to Improve their Search ranking and to eliminate Poor Websites. It is updated on monthly basis and so far 20 Panda Updates have been completed. Hope that answers your question Peace and Blessings. Sending a Reconsideration request is a Good thing but if you think your website's traffic is down due to Algorithm then you may send a request to Google to Review your Blog. But before, you have to make sure your each and every Article is of perfect quality. you right if you would go to rameez bloger so you would see that he is also spinning. Hello syed, sorry for off-topic brother but I need a help. I purchased a domain from Bigrock and I set up my domain after all done my blog not open without www. This work bcoz I added www please help waiting for your reply. Dude that was catch in the SPAM because your Comment was not relevant and moreover it has a Link Back to your site. Peace buddy. Updated Google Algorithms bring lot of changes in Search Engine Results because Updated algorithms give more important to those websites that have..
High priority, relevant back links. Quality content, that provide correct info to user according their search query. Good design and navigation structure. In this post you provided best info about latest updated Google Panda, I hope it will be helpful get good awareness about Google Algorithms.